Hi. I found this photo from exhibition from British Musuem. Do you know what is this small bronze/gold eye? A piece of helmet? Maybe you know something more? It is an eye piece from Gevninge near Ljere in Denmark. 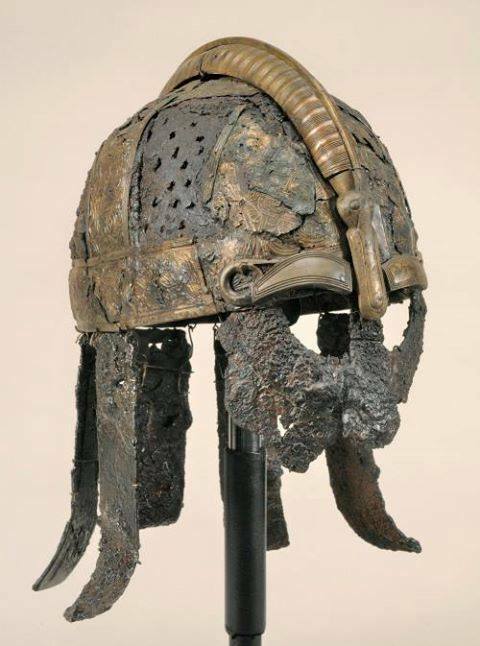 It is thought to be one of a pair from a helmet and it is gilded copper-alloy. 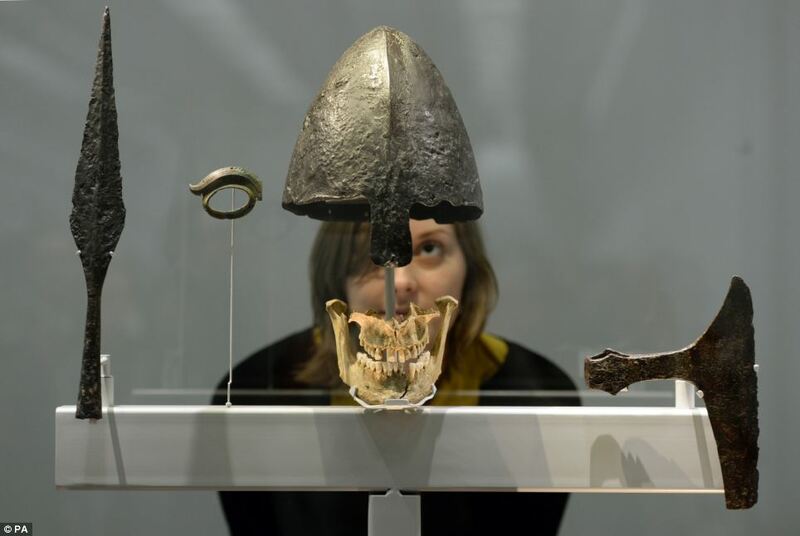 It is almost certainly pre-Viking and was found in what is thought to be ritual circumstances, in other words it may have been given to the gods. What are my eyes seeing? A conical helmet that i had never seen before! is anyone aware of the origin of this conical? partially gilt copper alloy, late iron age/viking age, Gevininge, Zealand, Denmark. The skull section is wonderful (in a bad kind of way). I'm doing demos for the exhibition and people still don't believe its been done by a weapon. The object you are seeing is a copy/replica (not the best) of a conical helmet found in the Lednica Lake, in Poland, between Poznań and Gniezno (52.524885, 17.376373 google maps). (destruction happened during it's conservation). Besides the age the helmet does not have anything in common with the vikings. 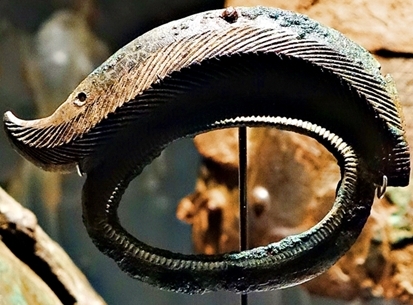 The eyepiece's closest parallels are from the Vendel Period - nothing like it has ever been found from a later context. It is a metal detector find, so had little context and the area has not yet been fully excavated. although the area is thought to be a settlement site. (Christensen, 2002 Kongens mand – guld og hjelm fra Gevninge in J. Pind, A.N. Jørgensen, L.
National Museum of Denmark, pp. 41-5..). Nothing like replying to a thread three years after the fact, but there's now a Wikipedia page on the Gevninge fragment which contains most of the published information on it. There's also a relatively new (2015) book by Tom Christensen (Lejre bag myten: de arkæologiske udgravninger), but it is unfortunately only in Danish. 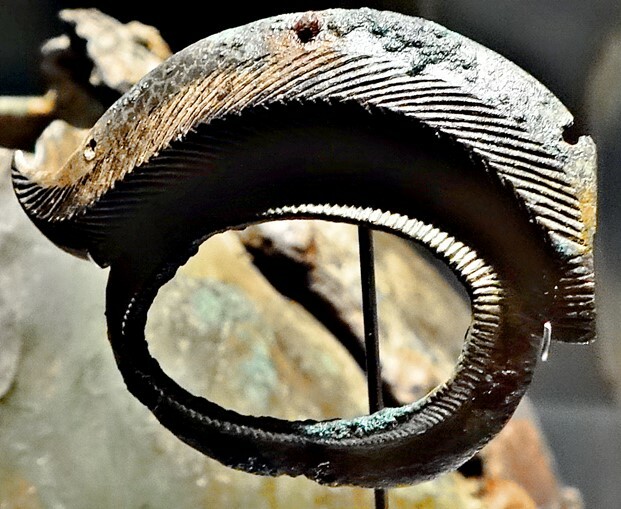 Christensen dates Gevninge to 500–1000 AD, which accounts for the fragment being dated to either the late Iron Age or the Viking Age. Paul is right, however, that dating the piece based on its stylistic characteristics suggests a tighter date (550–700 AD per his paper). It is interesting that the fragment has three holes, presumably attachment points, on both its top and its bottom. This suggests a slightly more elaborate helmet than that sketched by Christensen (2002, see attachment). It could, for example, fit onto something such as the nose/eye guards on the Vendel I (picture) or Valsgärde 5 (picture attached) helmets.